Paul and Sara Burden have a lot to be excited about these days. Photo by Robert Jacob Lerma, courtesy of 44 Farms. BuffBurger’s new Montrose location, the future Alabama Row. Rendering by Ziegler Cooper Architects, courtesy of EDGE Realty Partners. Located a block north of The Menil Collection, the new BuffBurger will be the anchor for a small boutique retail development on the northeast corner of Alabama and Mandell. With the assistance of Cisneros Design Studio, the Burdens are designing a 2,500 square foot, open concept space that sports high ceilings and rustic Texas charm. The Burdens hope it will serve as the flagship concept and set the style of future BuffBurger locations. Ample on-site parking will be on the north side of the building. Truffle Fries with Parmesan, truffle salt and truffle aioli, and the BuffBurger with cheddar cheese. Photo by Scott Sandlin. 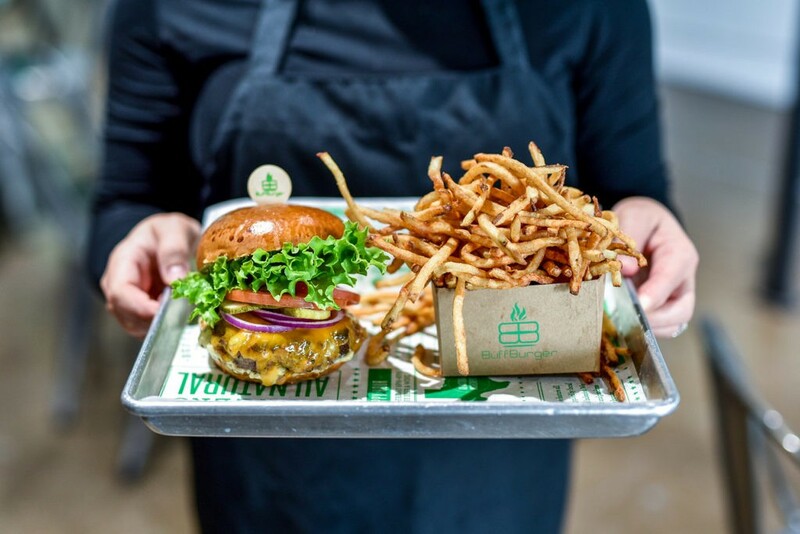 The menu at the new location will feature beef from the Texas Black Angus ranch, 44 Farms, burger buns from Slow Dough Bread Co. and cheese from Houston Dairymaids. The original BuffBurger is $7.95, with lettuce, tomato, red onion, house pickle, and housemade mayonnaise, and can be embellished with large variety of toppings for a slight upcharge. BuffBurger’s standard beef patty is just over one-third of a pound, and is cooked medium, unless otherwise requested. BuffBurger also offers an Ahi Tuna burger with avocado, sprouts, pickled carrots, daikon, and a housemade wasabi tartar sauce. The Momo features a grilled chicken breast with roasted poblanos, avocado, Point Reyes Toma cheese, lettuce, tomato and green Tabasco mayonnaise. These are $10.50 each. The current special is a crispy Pork Belly Bánh Mì burger, anchored by a generous slab of a 22-hour sous vide pork belly that’s flash-fried until crisp then topped with housemade pickled carrots, cucumber, and BuffBurger mayonnaise. 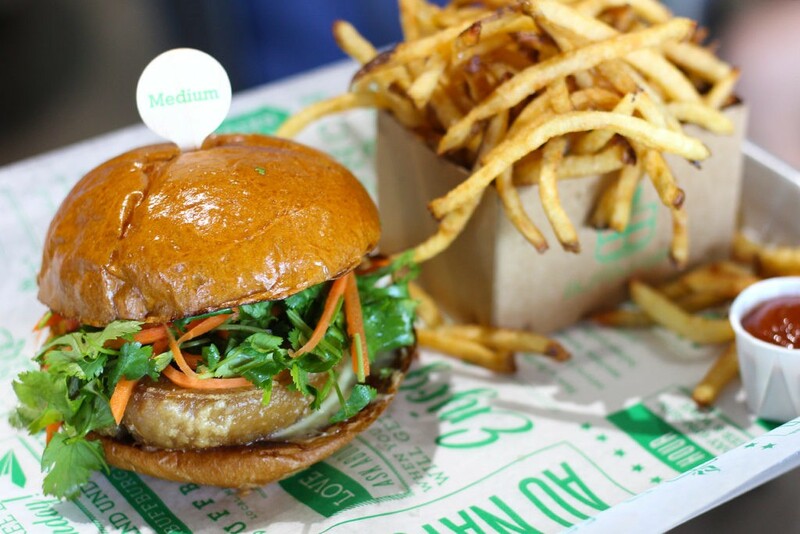 The Pork Belly Bánh Mì Burger. Photo by Scott Sandlin. The vegetarian burger is the Fritter, a street corn fritter patty, topped with chunky guacamole, pickled red onions, lettuce, and tomato for $7.50. Gluten-free buns for all burgers are available by request, and any sandwich option is available “In The Buff,” wrapped in fresh lettuce leaves. Two large dinner salads are also on the menu, as well as a side salad with a house avocado vinaigrette for $4 when you feel a need to skip the fries. 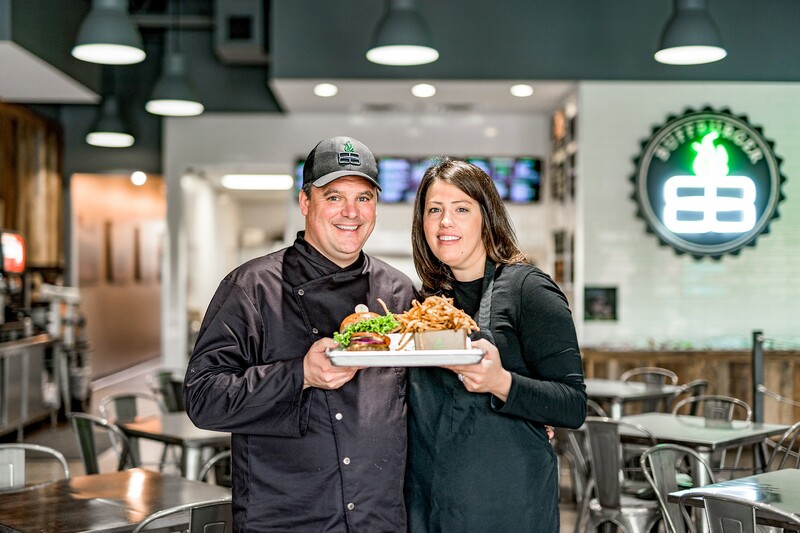 The new, larger location will feature an expanded menu thanks to having room for the space and equipment for curing and smoking bacon as well as for preparing lamb burgers and duck pastrami. This could be your BuffBurger and Fries. Photo by Robert Jacob Lerma, courtesy of 44 Farms. The Burdens spent quite some time working on their French fries prior to opening the first BuffBurger. They tested hand-cut samples in typical 1/8-inch and 1/4-inch strands, but ultimately settled on a cutter size in a size between the two standards to achieve the desired stability, crispness and fluffy interior. The potatoes are cut, rinsed to remove excess starch, blanched briefly in hot oil, drained and cooled, then returned to hot oil for finishing when an order is placed. 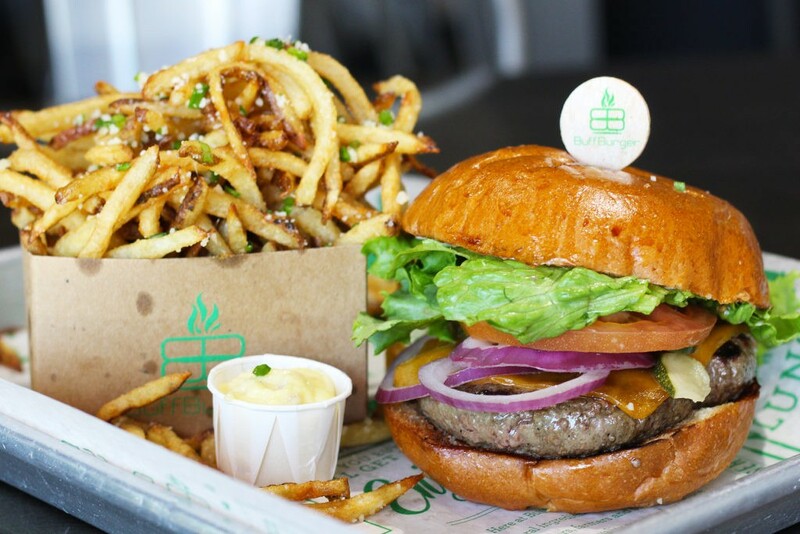 BuffBurger Fries with housemade jalapeno ketchup are $2.75, and Truffle Fries with housemade truffle aioli are $3.75. In time, the Burdens hope to have four or five BuffBurger locations in the Greater Houston area. BuffBurger 1014 Wirt Road, Houston, TX 77055. (281) 501-9773. Open Sunday through Thursday, 11 a.m. to 9 p.m., and Friday and Saturday, 11 a.m. to 10 p.m. Happy hour is 6 p.m. to 8 p.m., Monday through Friday, with half-price beer and wine. Kids eat free every Monday and Tuesday with purchase of regular meal (dine-in only). Delivery available via the Waitr app. Editor’s Note: edited to reflect correct neighborhood of Montrose. Beyond excited about this because it’s closer to us!! So happy for the Burdens! It’s well deserved by two great people.